With an exeat weekend for the school a large number of fixtures occurred midweek and it was an impressive showing from both the hockey and netball clubs finishing unbeaten against Wellington College and Bryanston respectively. We also had several pupils competing and training on what was a free Saturday for the vast majority of the school. Two of the netball teams were battling hard at a windy National Schools‘ Championships in Hertfordshire, five of the cross country team competed at a very wet and muddy ESAA National Championships in Leeds and there were also national hockey squad sessions for Molly Fairbairn, Martha Taylor and Will Whitmore plus national sailing squad training for Abby Childerley. The round up from last week starts with the lacrosse 2nd team who went to play their last match of the season against Talbot Heath. With the strong winds suggesting that the match would be more difficult than we first anticipated, we knew we had to make sure all our passes were accurate in order to succeed in scoring goals. The match started well, with Maddie Lyles’ powerful draws from the centre proving to be essential to the success of our team. With the first goal scored by the opposition, we knew we had to focus on our defensive play and the placement of our players on the pitch. As the match went on, tactical defensive play from Nory Warner, Faith White, Sophie Hussey and Frances Fleming helped us to open up a lead over Talbot Heath. With skilful play from Georgina Litchfield, Thea Ellis and Izzy Woodward, we continued to find the back of the net with more ease as the match went on. With Ellie Whitworth’s placement on the pitch often being the leading factor in the success our team, and the communication between all the girls certainly aiding our goal scoring, we finished the match 10-2 to Canford. Lizzie Graham was a superb goalie, continually saving goals with conviction and proving to be such a vital part of the team. Last week there featured matches for the hockey club versus Marlborough College, Wellington College and the U14 Tier 1 West Finals. Overall, there were 9 wins, 3 draws and 1 defeat; 44 goals scored and 10 conceded. On Wednesday evening, the 1st XI played their final U18 Tier EH 1 league match, hosting Marlborough following the postponement for snow back in January. Having already qualified for the quarterfinal draw after back-to-back wins the previous week, the game provided an opportunity to try some tactical variations and provide players with valuable game time. We started fast; George Baugniet converting a penalty stroke for a 1-0 lead after Harry Pickard’s penalty corner effort was stopped on the line by the body of a Marlborough defender. A carbon copy occurred only minutes later, but this time the resultant and correct advantage should have allowed Lochie Fulton to score from close range, but he somehow screwed his shot wide. Thereafter, we dominated proceedings, utilising space in behind their midfield and back line with some well-placed aerials. Baugniet doubled our advantage from a nicely worked corner and we should have added several more as we racked up 12 penalty corners on the game. However, Marlborough were resolute, and a combination of some last ditch defending and wasteful finishing kept them in the game. They then pulled a goal back near the death with a corner of their own... and the game ended in a 2-1 win, which did not really paint the whole picture. However, a maximum 9 points from our last three league games is a great return, and we look forward to playing Marlborough again this weekend. Elsewhere on Thursday, the 14As travelled to Millfield for the U14 Tier 1 West Finals. Game 1: Dean Close 0 Canford 0. You wouldn’t necessarily pick this as an opening fixture of the day – DC are perennial qualifiers from this tournament, with the advantage of a well-coached prep school set up, and we knew this was going to be a big ask. In the end, it was Canford who looked by far the more cohesive. We outplayed Dean Close in the first half, moving the ball confidently and accurately around the pitch, and pressing Dean Close back throughout the first half. The second half was more even; they had slightly more of the game in its opening stages, but their only chance was a penalty corner that we dealt well with. We had a couple of chances at the death, but a high quality game – I suspect probably one of the best played at any stage during the day – ended 0.0. That was fine: a point form the opening game in a group of three is a good start. Game 2: Canford 2 Marlborough 0. We were quickly back on pitch to play Marlborough. We didn’t replicate our silky best hockey in this game, but were comfortable for the large part. Will Pickard got the vital first goal, latching onto a half chance on his left hand post. This should have led to us controlling and dominating the game, but the gremlins got to us towards the end of the second half, and we were guilty of trying to overplay. We had to diffuse a bit of frustration at half time, not totally successfully as we didn’t really get into our stride until well in to the second half, but we did score a peach of a penalty corner goal to make the game safe. Our zigzag move, which Rupert Hutton and Oscar Berridge have perfected, put Rupert free on the stroke spot and he found the corner for a beautifully constructed second. So, we were safely out of the group as runners up, as Dean Close scored heavily against Marlborough, reinforcing what an accomplished shift we had put in to outplay them in the first game. This week sees the final block fixtures of the term, with a full house of 12 matches versus Marlborough College. The 1st XI also look forward to preparing for their U18 National Schools’ Tier 1 quarter final clash, away at Whitgift on 26th March. The first ever U16 basketball match for Canford took place away against Bournemouth Collegiate School last Thursday. The team were led by the impressive Michael Ma, a mainstay of the senior team even as a fifth former, and he didn’t fail to deliver. A “double-double” of 15 points and 12 rebound laid the foundation and Tommy Qian, who also bagged a “DD” with 12 points and 14 rebounds, superbly supported Michael. There were important cameos from Lucas Au claiming 6 “boards” and 6 points and Edwin He chipping in with a couple of key assists and points. Fourth formers Henry Bailey and Jake McAllister also made vital contributions as the teams secured a close fought victory 35-30. On a rather windy day, the 1st XI football team was made to defend deep with the wind a twelfth opposition member in the first half. Our ability to shut down space and be compact in shape meant that Sherborne didn’t muster a single shot on target, though, and when the opportunity came for us – as it always does – the rapid and amazingly altruistic Tom Suddards saw to it that we took it. Outpacing two defenders before rounding a third he only had the keeper to beat when he rolled a peach of a pass to Wilf Raby to slot it in. The second half was a very different beast, with our combative midfield seizing control and the Oaks playing the better football. Harry Moores scored an absolute screamer – hammering the ball into the top corner, before we made sure towards the very end. It might not have been the boys in blue’s best performance, but their defensive resilience – nay fortitude – paired with their ability to cut to the thrust when countering saw them comfortable winners in the end. The Oaks righted the only blemish on this term’s fixture list – a 2-1 loss in January - by beating Sherborne 3-0. On Saturday the U14 & U16As competed in the England Netball National Schools’ Finals. They played 8 matches against some of the best netballers of their age in the country. The U16 girls came up against previous National’s rivals, and this year’s ultimate U16 champions, Parrenthorn in the first round. They ultimately lost 12-9 after coming back to win the second half. Second match was a close victory against Maiden Erlegh School by7-6. RGS Newcastle was the next match and the girls played extremely well to obtain a 7-7 draw against strong opponents. The last game before lunch was unfortunately a 10-7 loss versus Benenden who just managed to run away with it towards the end. After a bit of regrouping and refuelling, the girls came running out of the gates to secure a 12-5 win against traditional northern powerhouse Grammar School at Leeds. 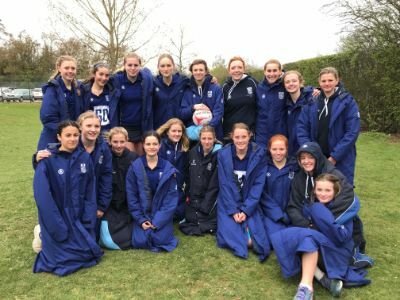 King’s School Worcester pushed the girls to their limits in the next pool game managing a 14-10 victory14-10, the largest winning margin any team managed to score against us. Northampton HS provided the girls with a 10-5 win in the penultimate match before unfortunately losing to Bedford Girls School 7-5 in an extremely hard fought final game. The English Schools Athletics Association Cross Country Championships is one of the biggest single sporting events of the year for school sport and has proven to be a showcase for future Olympic and World Championship distance runners. 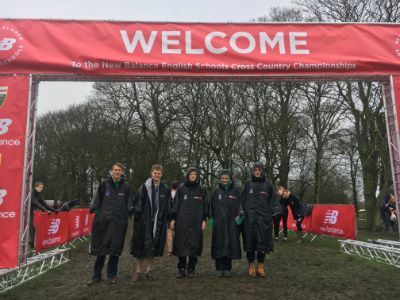 This year the race took place on a hilly and muddy course in Leeds and Canford provided five members of the 48 strong Dorset Schools team – a record number of representatives for the school. All five runners: Jamie Barrington, Jackson Kennett, Ines Mitchell, Charlie Bird and Josh Davey were racing against over 300 competitors in their respective races, reflecting the significant strength in depth across the country but special mention to Charlie for finishing in the top half in the senior boys race. Five crews from the Boat Club headed to the Olympic lake in Windsor on Monday to take on the rest of the nation at the Scullery Head. The race was set over two 1800m pieces. The course started at the finish end of the course racing up for the first leg, before turning and returning down the lake for the second leg. Conditions were tough with a strong headwind to row into for the first leg up the lake. The senior girls took to the water first, with two quads competing. Imi Gallego, Grace Hewett, Lucy King and Tessa Marley recorded the faster total time of our two crews, taking 18th place overall having overtaken Surbiton in their first leg racing into the unforgiving head wind. Rachel Ko, Liv Imms, Charlotte Wittram and Kiki Sullivan came in 16 seconds behind them in 23rd place of 36 crews. The Fourth Formers raced in the late morning. One girls’ crew of Joanna Way, Buzz Borneman, India Herrington, Scarlet Raymond and cox Louisa Borneman took on 66 other crews. A valiant effort from the girls in deteriorating conditions from earlier in the morning, let alone considering the fact the race totalled over 2000m longer than anything they have raced before. The girls finished in 65th place, and even though it was not a result they would have wanted, all were rightly proud of their efforts, having had the chance to race on the Olympic course. The same can be said of our 4th form boys who in turn took on 69 other crews – a very competitive year group. The faster of our two J15 boys’ crews was that of Jackson Kennett, Archie Gardiner, Ben Shaw, Tim Downing and cox Tom Peacock who came in at 56th place. The crew of Beau Gater, Charles Allen, Eddie Bloxham, Louis McHamish and cox William Oliver came in 90 seconds later in 67th place. A great day out for some of our younger rowers to experience the grand stage of an Olympic lake with the rest of the nation. Results aside, the enjoyment and sense of achievement for these young rowers was immense and encouraging for future events. Our Senior girls held themselves extremely well in their first race of the year, giving us lots to be excited about as we approach the Italy training camp. There is still a chance to get some more racing in before the end of term as we head to Exeter this coming Saturday.